I went into this race with the expectation to give the very best I have on that day and give myself a reward for the training and hard work I have done over the last few months leaning into the race. 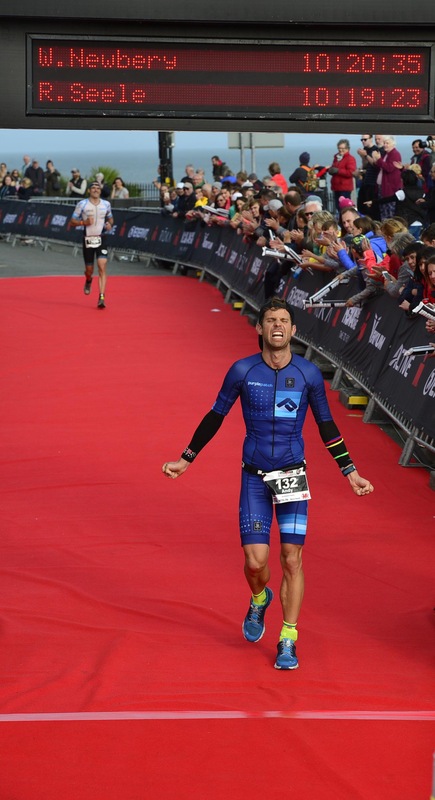 Ironman Wales is know to be one of the thoughest Ironman races in the world and after finishing the race I can say it was hands down the hardest race I have ever done so far. It was a phyisical challenge that made dig deep. Mentally i was in a very good shape and I am very proud of how I responded and handled the challenges I had during the race. I got myself familiar with the swim course prior to the race and I liked the way of how it was layed out. On the day we had wind and a decent swell and current, which made it quite difficult at some sections. I was intentionally holding back during the start of the swim to preserv energy. My goal was a sub 1hr swim time that I thought was possible on that course. It took my a while to find a rythm but after the first turn I gave myself enough space in the water to swim on my own terms. It felt good and I had everything under control. It was a very smooth swim and after exiting the water I was happy with how I executed the swim and I set myself up for a good day. The long run into transition (about 1km) with changing clothes cost me some valuable time too. The knew the bike course will be very challenging. Riding a few sections of the course prior to the race, it was clear that it will be lots of climbing, fast decents and some wind handling on the flatter sections (which weren't a lot really). The first 77km were the easiest part of the course where you could make up some time and speed. After settling into a rythm I started to push the pace on the first section. Managing the head winds and some of the sharp decents were tricky but I think I did very well using the tools and skills I have developed. Looking at my watch after 2hrs into the race I noticed that I was pushing good power and also speed (210 Watts, 34m/h) before I started the second part of the bike course which consists of 2 laps. That's where things started to get really challenging. 20km of climbing, followed by sharp and difficult decents, very steep climbs (16% and 14%), wet and narrow roads. I managed it well and I tried to preserve energy on the first lap, knowing that I have to do it all over again. From an effort level it was a low Zone 3 most of the time. I tried to keep a lid on the power climbing up those steep sections but with the crazy crowd that pushed you it was quite difficult to not overdo things. After I finsished the first lap I got into my first challenge of the race. I think I was drinking too much until this point as there was enormous pressure in my bladder building up. I didn't want to stop so I kept riding but it just got too difficult and painful to ride so I had to force myself to stop and go for a pee. For a good 1hr or so I lost valuable time and rythm. I also wasn't able eat or drink and it was hard to get back into it. I also noticed a drop in my watts. With 600m of elevation and 4 loops to run I was prepared to suffer and dig deep on that one. The first lap went like a breeze, nice and smooth pace, good rythm but once running down that hill my quads were starting to hurt big times. From then on it was struggle town and I had to push myself to keep a good and strong pace. On a good note my energy levels weren't too bad. I wasn't in a big deficiency and I always felt in control by adding calories when needed. But the legs were my limiting factor on the run this time. It was an up and down until km34 or so. I had tried to push the pace on the downhill and manage the longer uphill sections by working on form and posture. That worked out quite well as I started to get into a rythm that I was able to manage quite well without fading completely. From km34 onwards, after I finished the last climb on the last lap I unleashed all I have got left and to my suprise I was almost running as strong as at the start of the run. Not sure where I got that energy boost from but I felt strong and in good shape on the home stretch where I was able to make up a few places to run myself into a 6th place in my AG and 38th overall. During the run I had no idea where I was ranked and too be honest I couldn't care. I wasn't outcome driven and I just wanted to give all I have got on that day. In the end, I am very happy and proud of my performance and too be honest a bit overhelmed by making it into the top 40 in one of the hardest Ironman races in the world. Compared to my last Ironman races where I was ranked in the mid 100s overall, this was a massive move forward for me and a little breakthrough. Knowing that I can still improve in some areas (yes, bike strength it is) and that I am not far off the top age groupers anymore, gives me massive confidence for the next season. My continous improvements are an obvious sign that I am moving in the right direction to where I want to take it in this sport. Although a little bit dissapointed that I missed out on a Kona slot by 1 place, looking back now I think I am just not quite there yet. I know it's just a matter of WHEN and not IF, so I am even more motivated for next season and the ones that will follow.